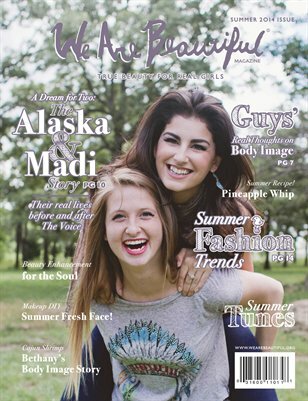 July-August Issue of We Are Beautiful Magazine takes a close look at how insecurities sometimes take over our summer and steal all the fun the summer can offer. Within these pages you will find stories of real women that have believed the lies about beauty, but conquered and now are enjoying life like never before. An interview with Alaska and Madi, the Okies that rocked at the show The Voice will inspire you to dream and our recipes and DIY will give you some fun ideas for this hot season. We hope you can enjoy and be refreshed through every page. Other Publications by We Are Beautiful Inc.